Alpental is one of four base areas at the Summit-at-Snoqualmie, separated from the other three by Interstate 90. Alpental offers the most advanced and expert terrain at the area with runs like Upper International and Shot Six. Enjoy a 360-degree view and 500 acres of backcountry terrain alongside 300 in-bounds acres, plus your choice of either black or double-black downhill runs from the top of Chair 2, the Edelweiss chair. Alpental is served by three double chairs and one detachable high-speed quad, has 2,280 feet of vertical, and averages 434 inches of snow a year. 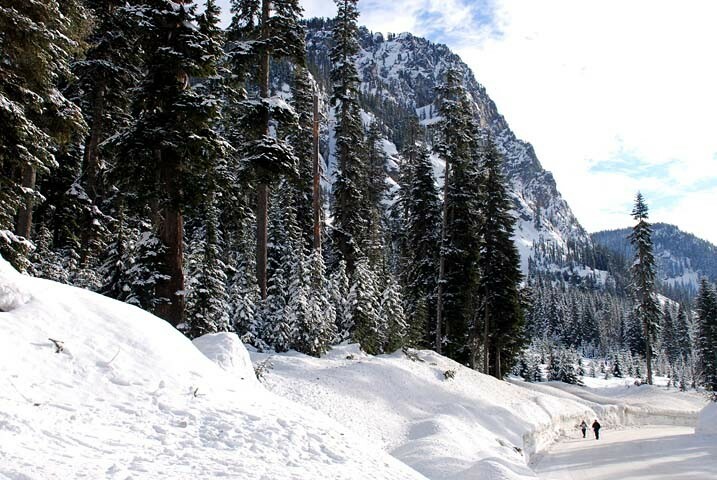 The Alpental Lodge's Tyolerstube Restaurant serves pizza, grilled items, fries, soups, pastries, and micro-brews. The Backcountry Kitchen in Denny Mountain Lodge has a diverse lunch menu weekends only. The Alpental store sells a full range of snow shovels, maintenance equipment, backpacks, clothes, goggles, headwear, jackets, and gloves. Nursery/child care available at Summit West. First aid at area; hospital located in Snoqualmie Valley about 28 miles away. Ski rental and repair available at the slope. Ski instruction offered in racing, lessons for juniors and children, snowboarding, and telemark.